J.D. 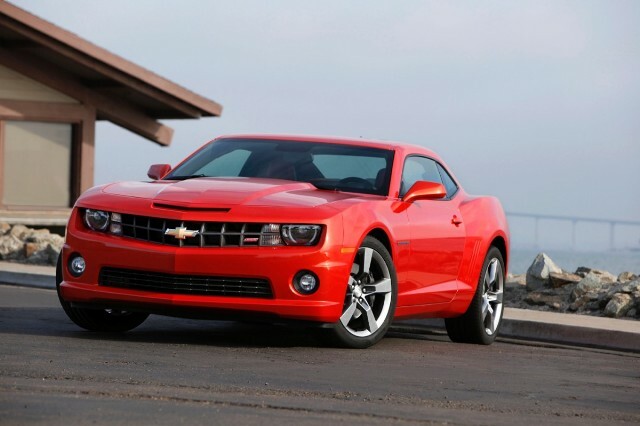 Power and Associates ranked the Chevrolet Camaro the industry’s most dependable midsize sporty car and the Chevrolet Tahoe as the most dependable large crossover/SUV in its 2013 U.S. Vehicle Dependability Study. The J.D. Power and Associates study tracked reliability during the third year of the ownership on 2010 model year vehicles. The fifth-generation Camaro took the highest ranking in its segment during its first year on the market. With increasing numbers of Chevrolet’s small cars on the road as the weather turns for the worse, Corry, Erie, Warren and Jamestown NY owners can drive confidently in conditions from summer thunderstorms to winter snow covered icy streets. 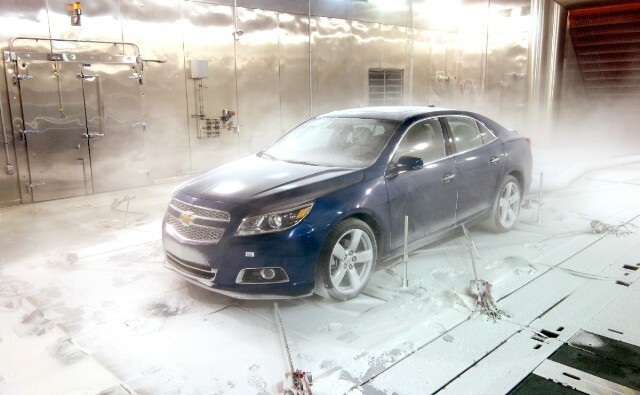 The 2013 Chevrolet Malibu Turbo endures sub-zero conditions in the General Motors Climatic Wind Tunnel where engineers take vehicle development and validation testing to the extremes. Neither snow nor rain, nor heat, nor gloom of night kept product development engineers from swift completion of the 2013 Chevrolet Malibu, available at Crotty Chevrolet Buick in Corry, PA. The location for all of this torture testing? General Motors’ Climatic Wind Tunnel in Warren, Mich., where all Chevrolet vehicles take on the elements. On the hottest days of summer, Malibu, which starts at $23,150.00, withstood blizzard and hurricane conditions inside the wind tunnel, where the temperature can replicate 40 below zero and the wind can blow 150 mph. Even on the coldest nights of winter, the tunnel’s temperature can easily climb to 140 degrees under 1,155 watts per square meter of simulated sunshine. At this state-of-the-art facility, engineers take vehicle development and validation testing to the extremes, subjecting powertrain cooling, cabin heating, ventilation and air conditioning systems to the harshest weather conditions found from Death Valley, Calif., and Denali, Alaska. The road-racing-inspired Camaro 1LE performance package returns for 2013 with unique gearing, suspension tuning and tires that make the model capable of more than 1 g of lateral acceleration and a sub-three minute lap time at Virginia International Raceway’s Grand Course. It is offered on Camaro SS coupes with manual transmissions. All Camaro SS models now feature variable-effort electric power steering and an available dual-mode exhaust system on manual transmission-equipped models. Both features were introduced on the Camaro ZL1. Introduced in 1935, Chevrolet Suburban is the original SUV and the oldest continuous nameplate in automotive history. Seventy-eight years later, it continues with the same blend of spaciousness and capability that has distinguished it for generations. For 2013, Crotty Chevrolet Buick in Corry, PA will offer the Suburban in LS, LT and LTZ models – in 2WD and 4WD – as well as half-ton and heavy-duty ¾-ton series. (LTZ is available only on half-ton.) A Hydra-Matic 6L80 six-speed is standard on half-ton models, optimizing fuel economy on the highway via reduced engine speed. Also, the lower-rpm engine speed on the highway enhances interior quietness. All models ride on a 130-inch (3,302 mm) wheelbase, which supports the Suburban’s generous passenger and cargo capability, while enabling a smooth ride for Corry, Erie, Warren and Titusville area drivers looking for the capability only a Chevrolet Suburban can provide. It is based on GM’s full-size SUV architecture, which features sleek, exterior styling; a sharp, precise driving feel; and excellent interior refinement and quietness. Behind the first-row seats, Suburban offers 137.4 cubic feet (3,890 liters) of cargo room, along with up to 8,100 pounds (3,674 kg) of towing capability (half-ton 2WD models). 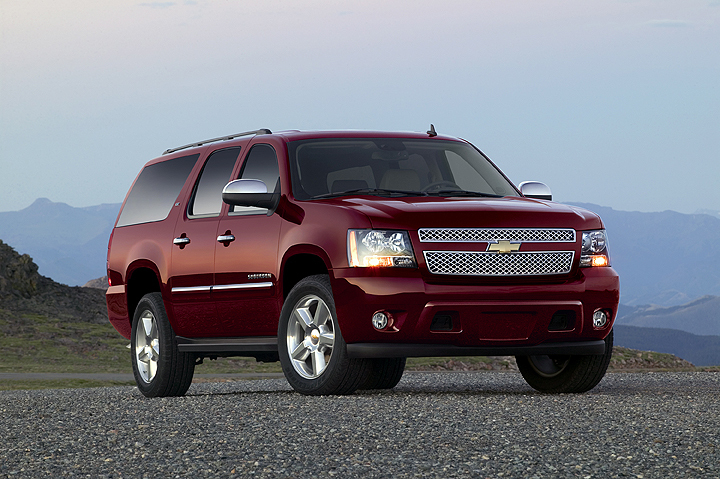 When properly equipped, Suburban ¾-ton can tow up to 9,600 pounds (4,354 kg). New for 2013 is a trio of exterior colors, including Champagne Silver Metallic, Concord Metallic (late availability) and Blue Ray Metallic (late availability). Also new is powertrain grade braking in the normal transmission mode – it was previously incorporated only when the Tow/Haul mode was activated. It uses engine torque to help slow the vehicle on descents, which helps reduce brake wear. Since its introduction in late 2011, the Chevrolet Sonic – the only subcompact built in America – has been making a name for itself among Corry, Warren, Erie, and Titsuvillle, PA drivers as a small car with big attitude. Available at Crotty Chevrolet Buick in Corry, PA for 2013, an all-new, performance-inspired, Sonic RS five-door hatchback model joins the Sonic family. Sonic also adds an available version of Chevrolet’s MyLink infotainment system, which uses owners’ smartphones to personalize delivery of music, video, photo galleries, phone books and other information into the vehicle – including full-function navigation via an available smartphone app. Standard on LTZ and RS and available on LS and LT models, MyLink for Sonic includes a seven-inch diagonal color screen, AM/FM stereo with seek-and-scan and digital clock, Bluetooth streaming audio for music and selected phones, voice recognition for compatible smartphones, and Pandora and Stitcher compatibility. Easy-to-use and intuitive, MyLink for Sonic was influenced by Chevrolet consumer data that shows 90 percent of target Sonic buyers own and are heavy users of smartphones. Other additions to the 2013 Sonic lineup include the addition of a rear decklid spoiler on the LTZ sedan. Sonic was designated as one of the Best Family Cars of 2012 by Edmunds and Parents magazine, and its interior was named one of Ward’s 10 Best Interiors for 2012. The 2013 Chevrolet Cruze available now at Crotty Chevrolet Buick in Corry, PA, provides the amenities, quietness, safety features, infotainment and roominess expected of a larger sedan, but with the efficiency and value of a compact car. For 2013, Chevrolet adds infotainment and safety technologies that bring even more value to Cruze. They include the Chevrolet MyLink infotainment system, standard on 2LT, Eco and LTZ models and available on 1LT. Two audio systems – including an AM/FM audio system with GPS-enabled navigation and a seven-inch-diagonal color touch-screen, are also new for 2013. Cruze also adds an Enhanced Safety Package – available on LT, Eco and LTZ models – that offers crash-avoidance technologies such as Side Blind Zone Alert, Rear Cross-Traffic Alert and rear park assist. Cruze is available in LS, 1LT, 2LT and LTZ models, as well as a gas-sipping Eco model that, when equipped with a manual transmission, achieves an EPA-estimated 42 mpg highway, making it the most fuel-efficient, gasoline-powered non-hybrid car in America. Crotty Chevrolet, the premier Chevrolet dealership in Erie County wants consumers to feel comfortable with the car buying process. That’s why the dealership is participating in a program that puts consumers at ease, by participating in the Chevy Confidence program. Crotty Chevrolet is allowing consumers an opportunity to return their new vehicle if they don’t love it, as well as experience special pricing on 2012 and 2013 models. This means that if you purchase a new 2012 or 2013 model year Chevy from now until September 4, 2012, you will be able to bring the car back to the dealership and return it if you do not love it. Chevy and Crotty Chevrolet are confident this won’t be an issue, but they are offering it just the same. The Chevy Confidence program has two main features. The first is the “Love it or Return it” option. This applies to all new 2012 or 2013 models and allows consumers to return their car within 30 to 60 days of purchase, provided it has no damage and less than 4,000 miles on it. The other feature is the “Total Confidence Pricing,” which applies to all 2012 model Chevrolets and places them at special preferred prices. This allows consumers to avoid haggling over a price, because Chevy is already offering its best value.